If a photographer’s experience was measured by the total time behind the camera, you might be hard-pressed to find one with more than a few days experience. So what does a professional photographer do with the rest of his time, you ask. Great question. The rest of his job is about seeing creatively, arranging the perfect shot in his mind, making whatever changes are necessary to stage the subject, arrange the perfect lighting and focus, remove the distractions and capture his imagined scene in such a way that he can share it with you. I’ve always had a love for photography. As a teenager, I was the one dropping off rolls of film at the pharmacy and counting the minutes until I could get my prints back. As a young adult, I shopped the Black Friday brochures looking for the best deal on digital cameras. Going through the lessons and exercises and suggestions in this book gave me a lot of information about photography but it’s really versatile and can be applied to the aspiring writer, painter, musician or (insert your craft here). I was really happy Blogging for Books allowed me to review this book. They provided me with a free copy in exchange for my honesty. 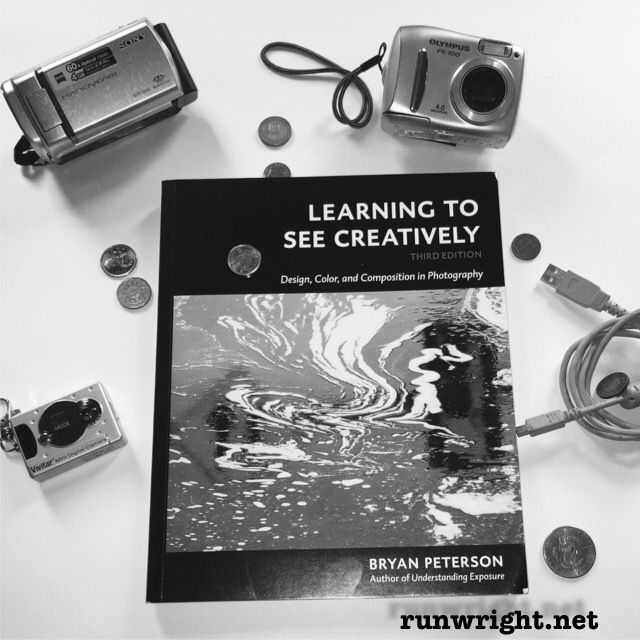 Learning to See Creatively, Third Edition is available for purchase on Amazon (affiliate links included) and would make a great gift for someone you know could use a little validation that you support their artistic endeavors. Additionally, the photos are so interesting, the book would look great on your coffee-table. I need to learn to use my fancy camera! I would totally enjoy a book like this. Heehee. I think you would but just know that you are not alone in this. I have other friends with fancy cameras that are collecting dust because they bought the Nikon (or Canon) thinking it would revolutionize their skills but then found out that experimenting with the different options is hard and can be expensive if you’re not sure what you really need. That’s one of the great things about the book – it shows the kind of image you can create and tips on how to create it, and alternatives for staging and cropping to frame just the right kind of picture. I was so impressed with the book, I got a copy for a friend who’s also an amateur photographer and he agreed that it’s a great guide too. That’s an interesting book. I believe that there is a world of beauty right in front of us waiting for our eyes to see it. I do believe we can “learn” creativity. It’s all a matter of opening oneself to new experiences without judgement. Thank you for joining #tiptuesday. That’s such a great way of saying it, Debbie – creativity is opening ones self to new experiences without judgment. I like that. Thank you for sharing it. Hi Run! This post will be featured on this week’s Tip Tuesday link party. oooh, That exciting, Debbie. Thanks so much for allowing me the opportunity to share what I’ve learned with others.